Students’ creative and critical thinking is a key outcome of interest as schooling systems in OECD countries position the so-called twenty-first-century learning skills as fundamental objectives of their educational endeavours. This policy shift has piqued interest in pedagogical models that promote student creative and critical thinking of which there are many. Most of these existing models focus on curriculum design rather than delivery. Adaptive teaching is a notable exception. This study posits a model of adaptive teaching that conceptualises the interaction of the personal and environmental determinants of adaptive teaching that influence the teaching behaviours that promote student creative and critical thinking. 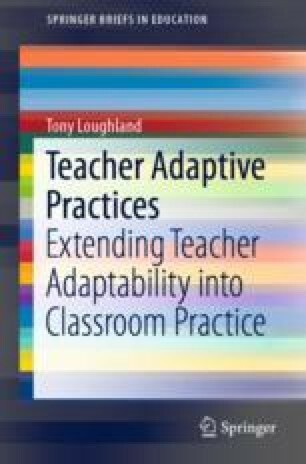 These teaching behaviours are labelled teacher adaptive practices in this study. Gibson, S. A., & Ross, P. (2016). Teachers’ professional noticing. Theory Into Practice, 180–188. https://doi.org/10.1080/00405841.2016.1173996. Victoria State Government. (2018). Education state ambition: Learning for life. Melbourne: Victoria Government Retrieved from http://www.education.vic.gov.au/Documents/about/educationstate/EducationState_LearningForLife.pdf. Zhao, Y. (2015). Lessons that matter: What should we learn from Asia’s school systems? Retrieved from Melbourne: http://www.mitchellinstitute.org.au/.